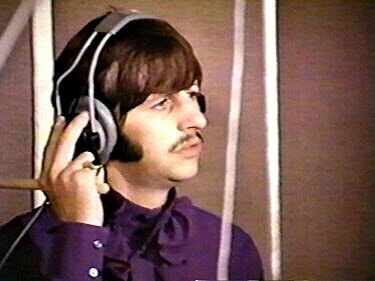 The Daily Beatle: Experiment in Television:Music! Music! was released in 1968 and it is a celebration of music in Britain, ranging from Tippett, The Beatles, folk clubs, brass bands right through to bell ringing. The Beatles footage captures rehearsals for "Hey Jude", and was filmed on Tuesday 30th of July, 1968. The Beatles recorded takes 7 through to 25, though according to Mark Lewisohn, it was not The Beatles' intention to capture the perfect recording yet. But this session was arranged as more than a means of rehearsing "Hey Jude", it was also arrenged so that the Beatles could be filmed for part of this documentary. The resulting film only includes around six minutes of Beatles footage, compiled from several hours of shooting, showing The Beatles busking, chatting and rehearsing. The musical takes recorded during this session featured just piano, drums and acoustic guitar - so there was no role for George Harrison. Music! showed him in the control room of studio 2 with George Martin and Ken Scott. "The film crew was supposed to work in such a way that no-one would realize they were there," recalls Scott. "But of course they were getting in everyone's way and everyone was getting uptight about it." Most of the footage used were from take 9 of "Hey Jude". Part 2 of 5. This part includes footage of The Beatles and Yehudi Menuhin. Part 4 of 5. This part includes footage of The Beatles (Hey Jude) and the Black Dyke Mills Band. Just so you know, there are some more, previously unseen Beatles clips from this same session in the last segment, in the montage for 'Land Of Hope And Glory'. These are without the original sound though. They are very short, one of each Beatle, about a second long each, but they are there nonetheless. Oops, it's not 'Land Of Hope And Glory' but they are in the last montage. Thank you Mark! If you've collected all the segments of Music! from YouTube and want to make a DVD out of it, Mark has designed a wonderful DVD cover for it here.